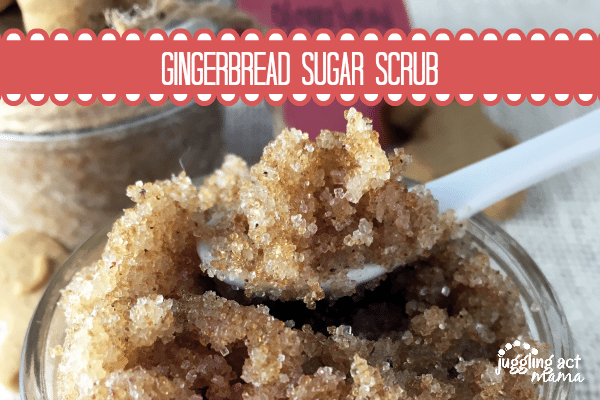 This easy homemade Gingerbread Sugar Scrub works as an exfoliant and moisturizer for your skin. It makes a wonderful stocking stuffer for the holidays! I love making my own DIY Beauty products at home. You can save so much money, and you know exactly what’s going into them. This recipe makes 16oz, you can pick up inexpensive 4oz plastic jars and you’ll have 4 stocking stuffers in no time. These are also great additions to a homemade beauty basket – pick up some exfoliating gloves, nail file, lotion, and put it all together in a pretty basket or container for a friend, teacher or family member. 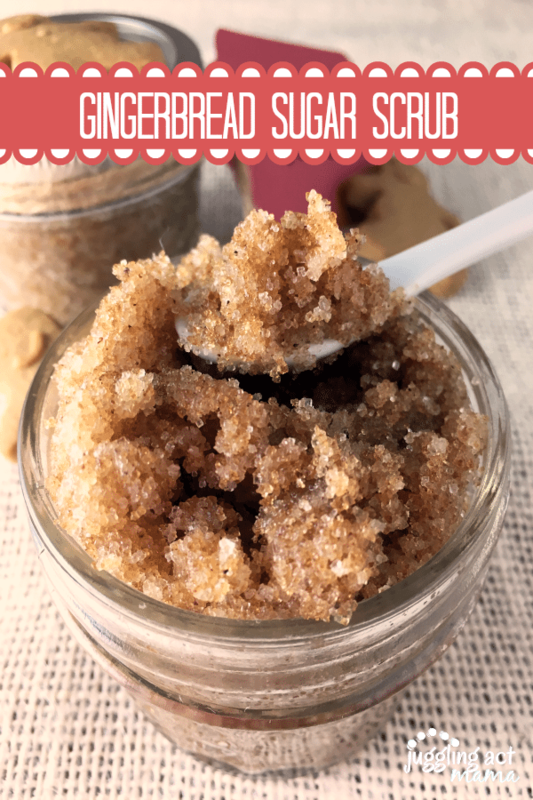 Here’s how easy it is to make your own Gingerbread Sugar Scrub in just 10 minutes! 1. Combine dry ingredients in medium mixing bowl. 2. Add coconut oil and vanilla extract to dry mixture. Stir well. 3. Store in sealed mason jar. Add a pretty ribbon and you’ve got a lovely homemade gift! this makes about 2 cups. For smaller stocking stuffers, I use two 4oz jars. This recipe is easily doubled or tripled if you have lots of stockings to fill. This also makes a nice addition to any bath and beauty gift basket. Want More Great DIY Beauty Ideas? Check out these other easy DIY beauty hacks you can do at home! This sounds absolutely wonderful! I will definitely be making some of this to give my friends over the holidays! I bet this smells fabulous! I have always wanted to make some of these but have yet to do it. Is they something you can use in place of the coconut oil? I’m allergic to coconut but I would still love to try this sugar scrub. I’m sorry, I’m not sure what you could use in place of coconut oil.